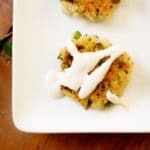 Quinoa Cakes with Yogurt Tahini Sauce | From Scratch Fast - Recipes & meals from scratch for busy cooks! I’m a sucker for cakes. Not the sweet kind—I’ve always been a pie kind of girl—but the savory, crispy kind. 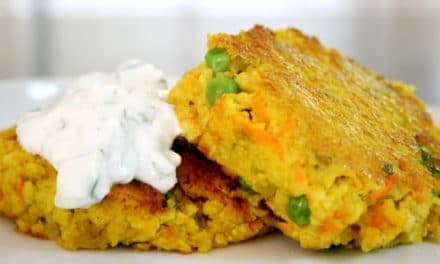 When Ella was a baby I would make big batches of shredded vegetable cakes bound with egg (butternut squash, sweet potato, zucchini), which were presumably for her, but mostly for me—I’d eat them hot out of the pan with a sprinkle of Maldon sea salt and a drizzle of yogurt. 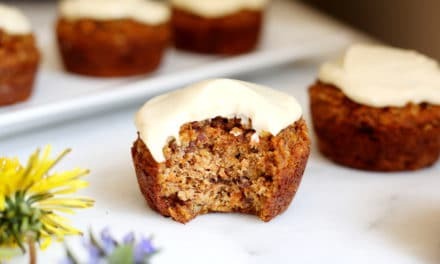 We’ve since enjoyed numerous other cake iterations, from curried millet cakes, to white bean and quinoa patties, to not-so-successful pea cakes (don’t ask). Last winter Mark Bittman published an article about quinoa cakes in the New York Times Magazine. The recipe struck me in its simplicity—there was no binder, he simply cooked (overcooked, really) the quinoa until it was starchy and sticky enough to hold together. I have to give it to the man—it’s brilliant. Forget eggs or binders, all you need is quinoa. I’ve since made nearly half a dozen versions of these crispy quinoa cakes, adding whatever flavorings I’ve happened to have on hand (they’re a perfect “emergency” meal when there’s seemingly nothing to make for dinner). My favorite by far are these scallion, pea and mint flavored cakes, drizzled with a creamy and cool tahini yogurt sauce. The cakes are fabulous on their own as an appetizer or main course with a salad, and I suspect they’d be great stuffed into pita bread with a tomato cucumber salad. A few weeks ago I served the cakes with yogurt-marinated turkey kebabs, grilled asparagus and plenty of the tahini sauce, which we slathered over everything. It was a perfect springtime dinner. I’m no longer am cooking for a baby, but I still find myself eating the cakes straight out of the pan. These quinoa cakes were inspired by Mark Bittman’s Crisp Quinoa Cake recipe from the New York Times Magazine. Instead of using a binder (such as an egg) to hold the cakes together, he simply cooks the quinoa until it’s starchy and sticky. Brilliant! These cakes are flavored with scallions, mint and peas and are served with a seriously addicting Yogurt Tahini Sauce. 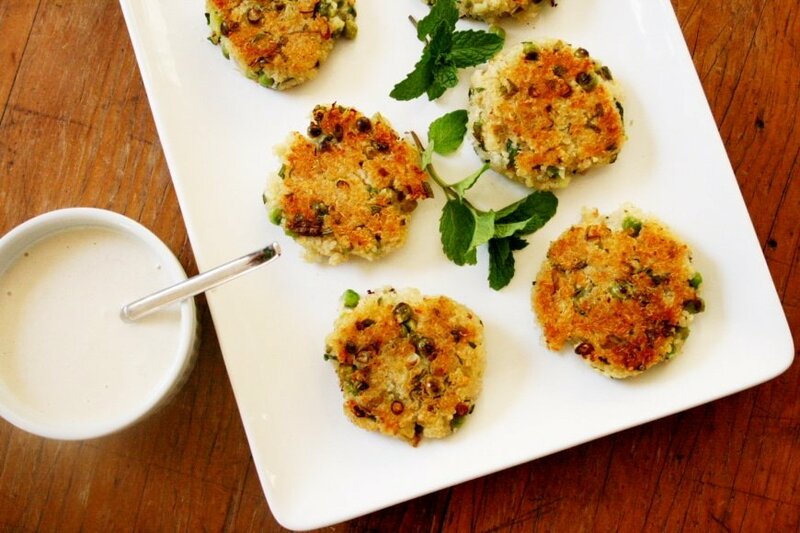 Serve the quinoa cakes as an appetizer, side dish or even main course. They’re sure to disappear fast! Using a strainer, rinse the quinoa well in cold water and shake dry. Put the quinoa in a medium pot with 2¼ cups water and season generously with salt. Bring to a boil, then reduce to a simmer and cook, covered, until the water is absorbed and the grains are very tender and starchy, about 25-30 minutes. Transfer the quinoa to a large bowl and cool slightly. Add the green onions, peas, lemon zest, lemon juice and mint to the quinoa and stir until combined. Season with salt and pepper to taste. Form the mixture into 8-10 patties. 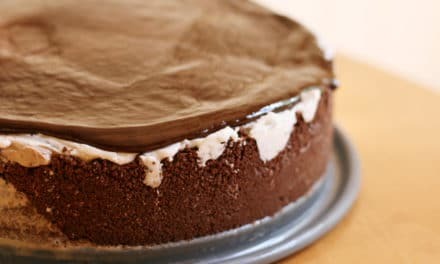 Do Ahead: The cakes can be made up to 8 hours in advance; transfer them a parchment or wax paper-lined baking sheet, cover them tightly with plastic wrap and refrigerate until ready to cook. Heat the ghee or olive oil in a large non-stick skillet (alternatively, the cakes can be cooked in batches in a smaller skillet). 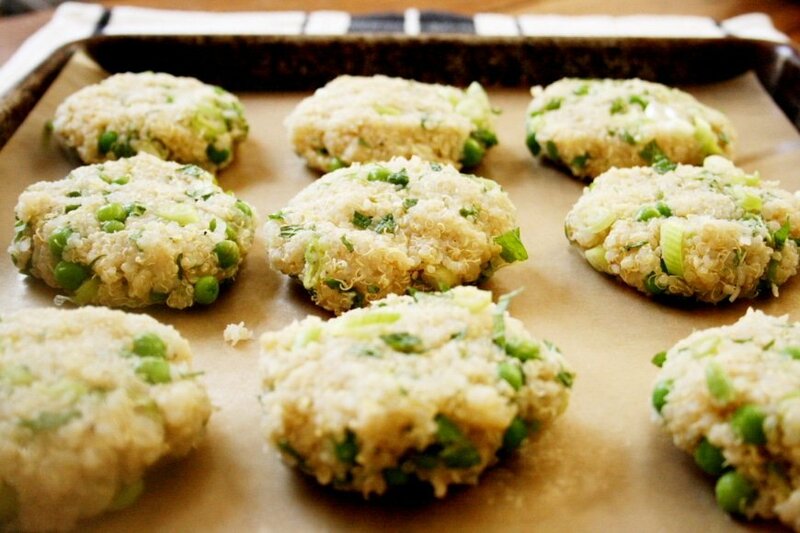 Add the quinoa cakes and cook until the bottoms are golden brown and crispy, about 4-5 minutes. Flip the cakes over and cook until crispy on the other side, about 4 minutes longer. 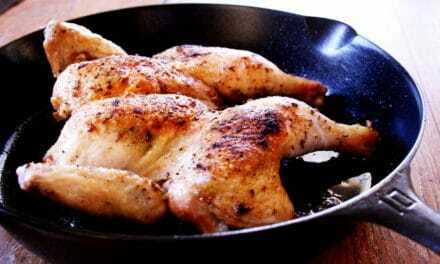 Remove from heat and sprinkle with salt. 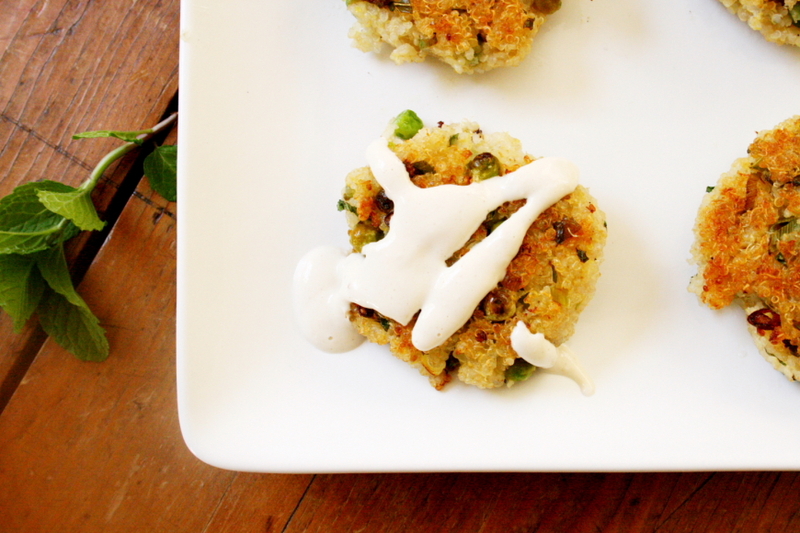 Serve the quinoa cakes with a drizzle of Yogurt Tahini Sauce, passing more at the table. Place the garlic in a mini food processor, and process until finely chopped. Add the tahini, water and a pinch of salt. Process until smooth. Scrape down the sides, and add the yogurt, olive oil and lemon juice; process again until smooth. Season with salt to taste. Do Ahead: The yogurt tahini sauce can be made up to 3 days in advance. Store in a covered container in the refrigerator. Bring to room temperature before serving. lance - . good info! !